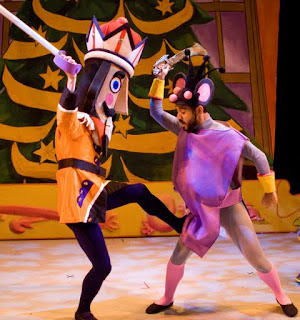 Mark Foehringer's “Nutcracker”, presented at the Children's Museum in San Francisco, is an absolute delight. Foehringer has taken the two-hour holiday extravaganza and compressed it into four scenes: Drosselmeyer's Toyshop, Clara's family Christmas party, Candy Land and a return to the Toyshop. This shorter “Nutcracker” is the perfect introduction for young children – they can experience classical and contemporary ballet, an engaging, linear story, and live musical accompaniment in under an hour. One noteworthy nuance is Foehringer's in-depth treatment of Drosselmeyer. Typically, this magical, mystical character makes his first appearance during a brief prologue or during the party scene (depending on the production). Here, we see Drosselmeyer in his toyshop, actually creating the life-size dolls and other Christmas surprises. Danced by compelling performer Brian Fisher, this unique first scene is integral in setting up Drosselmeyer to be the director of the events that follow. Foehringer also makes a special effort to demonstrate how the character's stories are intertwined. When Drosselmeyer arrives at the Christmas Eve party, he dances a pas de trois with Clara (Taylor Ullery) and the Nephew (Chad Dawson), who later becomes the Nutcracker Prince - a very active personification of the narrative (Clara loves the Nutcracker Prince, whom Drosselmeyer has created and given to her). When Clara journeys to 'Candy Land', she is greeted by the Sugar Plum Fairy filling the ambassador role: welcoming Clara and orchestrating the citizens of 'Candy Land'. In many versions of “Nutcracker”, Clara and the Prince are not participants, but rather passive observers; they simply sit and watch the different divertissements. Here, 'Candy Land's' guests were incorporated into all the dances. Drosselmeyer partnered the Spanish Chocolate, and everyone was involved in Chinese Tea. As the Sugar Plum Fairy (Lizanne Roman) began her variation, Clara stood behind her, mimicking and imitating her choreography. Then, the Sugar Plum Fairy actually began to demonstrate and pass down her movements to Clara. Foehringer transformed this famous solo into a spatial pas de deux for Clara and the SPF, a perfect metaphor for the Queen and her apprentice. It was also very fitting that her's (the Sugar Plum Fairy) is the last face that Clara sees as 'Candy Land' disappears. You must add Mark Foehringer Dance Project | SF's “Nutcracker at Zeum” to your December to-do list. His is a charming jaunt through the traditional holiday tale of Clara and her Nutcracker, particularly appropriate for the newest generation of theatergoers and balletomanes. Bravo to Foehringer and his company for their significant accomplishment!